BSJ | ‘Grand de Party’: Did the Tour de France benefit Yorkshire? ‘Grand de Party’: Did the Tour de France benefit Yorkshire? Portrayed as the ‘grandest départ’ in the Tour’s history, the Tour de France’s visit to Yorkshire was claimed to be an economic opportunity to showcase its thriving cities and scenic routes, yet its role as a regional invigorator has been questioned. In addition to short term road closures and travel disruption, the economic cost of preparing the route and the environmental impact of the event may undermine the value of its benefits to the region. The economic return from the Tour may be vast, with estimates of over £100 million for the region (Coldrick, 2013). This may be long term, due to the television coverage serving as a global advert for tourism in Yorkshire, or short term, with visitors spending on the weekend of the Grand Départ itself. This included hotels providing accommodation, restaurants and cafés catering forspectators, and local businesses selling roadside merchandise. Establishments such as Bettys Café Tearooms sought to cash in on the event, offering biscuit teddy bears adorned with polka dot jerseys and teaching staff basic French to provide a friendly welcome for visitors from across the channel (Brooker, 2014). Trinity Shopping Centre in Leeds reported a footfall of an additional 100,000 visitors on the weekend of the Grand Départ, with the later influence of a 19% increase on shopper numbers for the week beginning 7 July , based on the same week in 2013 (Yorkshire Evening Post, 2014a). Therefore, the Grand Départ appears to have provided both short and long term economic benefits for Yorkshire. However, does the economic return outweigh the costs associated with staging the event? Firstly, Amaury Sport Organisation, the association responsible for running the event, charges a staging fee to the towns and cities hosting the start andfinish of each stage (Edwards, 2014). For example, the City of York paid £500,000 for the privilege of hosting the start of the second day (City of York Council, 2012), excluding practical costs such as pedestrian cordons and public facilities. In total, stages one and two cost Yorkshire councils £3.2 million and £3.9 million respectively, in addition to the £10 million provided by central government (Edwards, 2014), thus suggesting that the £100 million estimated for the region is less significant than it initially appeared. Secondly, economic benefits associated with sporting events tend to be localised. For example, when the Tour last visited the UK in 2007, London benefited to a much greater extent than Kent, with the opening weekend directly generating £73 million and £15 million for the areas respectively (Transport for London, 2007). Similarly, benefits from the Grand Départ in Yorkshire seemed to accrue in the main centres, Harrogate and York, whilst smaller towns off-route reported fewer tourists and slow business. Consequently, the economic boost for areas en route was generated at the expense of draining peripheral areas. Thirdly, North Yorkshire Police complained as early as September 2013 that their resources would be stretched and that they would face costs of up to £1 million (BBC News, 2013), claiming that those bidding for the event underestimated the cost to local services. This led to officers in North Yorkshire being forced to cancel any leave planned for the weekend of the Grand Départ (The Press, 2014). Subsequently, it appears that potential economic benefits to local business came at the cost of stretching the viability of essential services and creating additional costs for the national taxpayer. Moreover, whilst the effect of popularising cycling may be environmentally beneficial as motorists are encouraged to use two wheels instead of four, there are concerns about the environmental impact of the race itself. From drinks bottles and food wrappers discarded by racers, to merchandise manufacturing and vehicle miles accumulated by spectators, the potential benefits gained from promoting cycling must match the carbon output from the race itself to elicit any meaningful environmental gain. Concern about the environmental impact of the race was exemplified when La Coalition Nature, a Belgian environmental group, launched criminal charges against a number of riders for littering in the 2010 race (Cycling News, 2010). Furthermore, a report by the University of Cardiff found the Tour de France to have one of the worst ecological footprints of all major worldwide sporting events. Speaking to spectators at the opening weekend of the 2007 Départ (London to Kent), the authors found the average distance travelled by spectators was 734 kilometres (59% of which was by air) and that an area 143 times the size of London’s Olympic Park would be needed to provide the resources used in the race (Collins et al., 2012). Therefore, although cycling is often believed to be a ‘green’ method of transport, the behaviour of riders and spectators needs to be considered when determining the value of the Tour for Yorkshire, and the wider area. Nonetheless, the event may offer some infrastructural benefits. For example, since providing the start line for the 2014 race, a £4 million project for the Headrow area of Leeds has proposed a 20mph speed limit, lowered kerbs for bike access and restrictions to private cars (Laker, 2014). This urban planning legacy is advantageous in reducing safety fears for potential cyclists, which appears to be necessary given that 61% of the public feel that roads are too dangerous for cycling (BBC News, 2014). Therefore, the rewards of the 2014 Grand Départ are not necessarily financial; they may be reaped in their impact on Yorkshire’s urban fabric. However, the subsequent benefit to urban centres in Yorkshire comes at the cost of considerable disruption during the race itself. Initially, planners warned of road closures lasting up to eight hours. 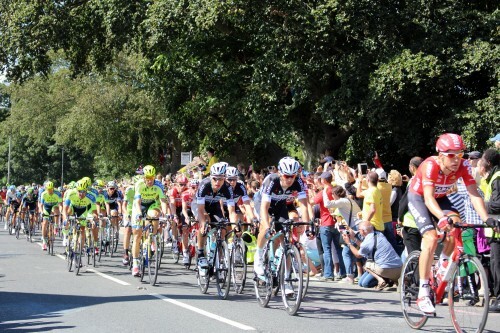 In practice, Harrogate witnessed road closures from midnight on Friday until ten o’clock on Saturday evening in order to allow the 158-vehicle caravane and riders to pass, dismantle barriers and disperse spectators. This disruption could, however, have the unanticipated effect of boosting regional public transport. With lengthy road closures, motorists were forced to seek alternative transportation and, as a result, network providers were compelled to improve service. For example, Network Rail doubled passenger capacity for the weekend of the Grand Départ compared to an ordinary Friday to Sunday period (Yorkshire Evening Post, 2014b). This further suggests that benefits of the Tour’s visit to Yorkshire were functional, rather than economic. To conclude, whilst the economic gains from the visit are yet to be precisely calculated, it appears that the income generated from the Grand Départ needs to be measured alongside the substantial preparation costs prior to the event. Furthermore, the often unconsidered environmental impact must also be accounted for in order to have a meaningful understanding of its value to the region. Nevertheless, the real benefit of the Tour de France in Yorkshire may be received in terms of its legacy to urban areas and transportation networks, demonstrating that the rewards are not just financial.